alternatives for power are more attractive than ever. percentages of current usage—close to 45 percent. percent increase in usage by 2025.
find “greener” plant processes. Renewable energy is one good consideration, but pros and cons must be evaluated. The SEP saves an average of 41.35 million Btus per year, reducing energy bills by $256 million. renewable power, generating nearly 10 percent of the electricity used in the United States. plants, depending on the amount of electricity needed. electricity to operate the turbine, it falls in the category of improved economics rather than renewable energy source. renewable plastics and natural fibers. gradually over the past several years. Earth. Instead, it is combined with other elements, as in water, which is a combination of hydrogen and oxygen (H2O). through photosynthesis, or by using electricity or sunlight to split water into hydrogen and oxygen. fuel to it. It never loses its charge. it will hold the best promise for powering our industries and homes. the extremely high temperatures of molten rock, called magma. this country most geothermal resources are concentrated in the West, geothermal heat pumps can be used nearly anywhere. to electricity also produces desalinated water. including similar methods to damming a river. provide power to the electric grid. energy-efficient hot water and hot-water heat for large commercial and industrial facilities. 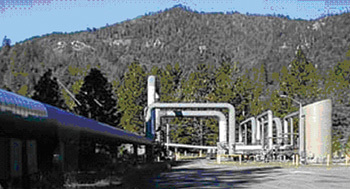 years, providing greater incentive for government funding of this fuel source. The DOE’s Industrial Technologies Program (ITP) has created a variety of programs to aid in industrial process improvements. of industrial energy consumption and represent the greatest opportunities to increase efficiency. national goals for energy and the environment. reliability and availability in most parts of the country, it also faces cost, environmental and alternative-use challenges. equipment would require thermal insulation. Solar voltaic energy shows the most promise in housing insulation and therefore shows minimal potential for industries. crowd-drawing aesthetics of “Old Faithful,” America’s oldest national park attraction. Hydroelectric power is the oldest form of electrical power generation and an important form of renewable energy, says Hart. downstream of the Grand Canyon on the Colorado River, and the source of Lake Meade. no hydropower energy sources require insulation, nor do hydrogen, solar and wind sources. future still looks very bright.